Lots of good things happen in David Pecaut Square (above is how it looked last night): my International Dance Day dance flashmob was there, and my favourite outdoor cinema, TIFF in the Park, takes place there too. But by far, one of my favourite happenings in this lovely little green space in the heart of downtown Toronto is Luminato, a 10-day festival of arts and creativity meant to reflect the multicultural mosaic of the arts in a city known for its diversity. The concerts that occur every night in the square, known as the festival hub, feature international and local musicians alike – all for free! Last night, I caught Italian singer-songwriter and rapper Jovanotti at The Hub (pictured below), and couldn’t resist his catchy beats, not to mention his alluring accent! I actually had no clue that he was singing in Italian – his cadence just sounded so lyrical and the drumming was so hypnotic, I couldn’t help dancing along with everyone else. Lest I forget the fact that I giggled every time “Toronto” rhythmically rolled out of his mouth! Sigh. I think I’ve a crush. That’s what’s so great about Luminato. There’s always something new to discover. It sounds clichéd, but it’s true. And though Luminato isn’t all about music (there also are plays, dance performances, opera, arts exhibits, screenings and readings), the concerts are what I’m inevitably drawn to, as I’m a sucker for an outdoor concert. I swear, I should have pitched my tent in The Hub for all the nights I’ve spent there this past week, from Somali-Toronto rapper K’naan to Stratford, Ont., songstress, harpist and accordionist Loreena McKennitt (shown below), whom I adored back in university. Considering the competition that music festival NXNE (North by Northeast) and the massive street party that is the MMVAs (MuchMusic Video Awards) give Luminato by running during the latter half of the arts fest (the MMVAs, cohosted by Katy Perry, occurs on the last day), this week Luminato has been my go-to festival for concerts. 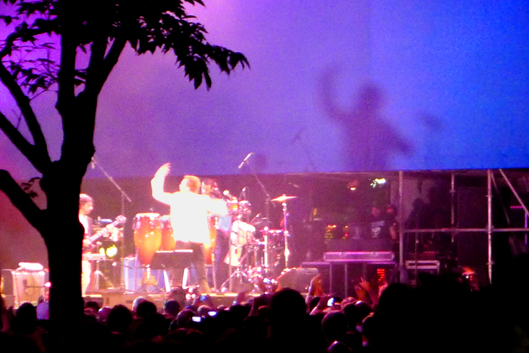 Perhaps much of the appeal of Luminato’s concerts is that they’re free, but so too are the MMVAs and many NXNE shows. Perhaps it’s that there’s a world music vibe to Luminato’s international artists – a nice complement to the Canadian musicians. But I think what really draws me (and others) to the Luminato hub is the green space itself. 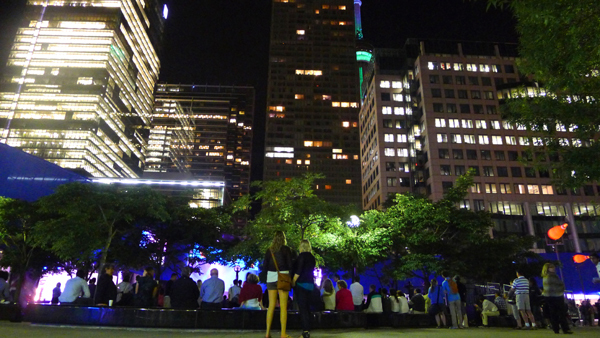 Being able to listen to a concert while I’m stretched out on the grass, surrounded by trees, with a glowing CN Tower peeking out between illuminated skyscrapers is a relaxing way to take in the musicians, whether they’re well known or a new-found pleasure. That’s what Luminato is to me: an inclusive, welcoming atmosphere in which to enjoy the arts in a way that represents us all. What: Luminato, a 10-day festival of arts and culture, which brings together the best artists from Canada and around the globe. Where: Throughout downtown Toronto. 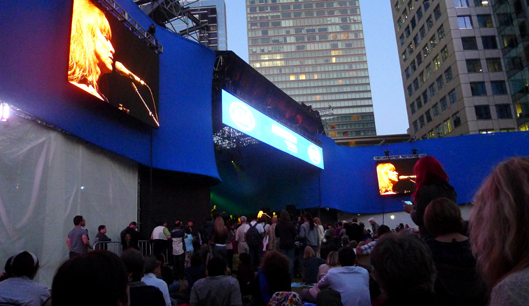 The festival hotspot is The Hub, in David Pecaut Square, beside Roy Thomson Hall, near John and King streets. When: Mid-June. This year it runs from June 8 to 17. Cost: Many events are free, but some are ticketed. Best to buy tickets in advance. Why: Toronto loves its festivals! This one, now in its 6th year, brings together multiple generations and cultures from across the city.